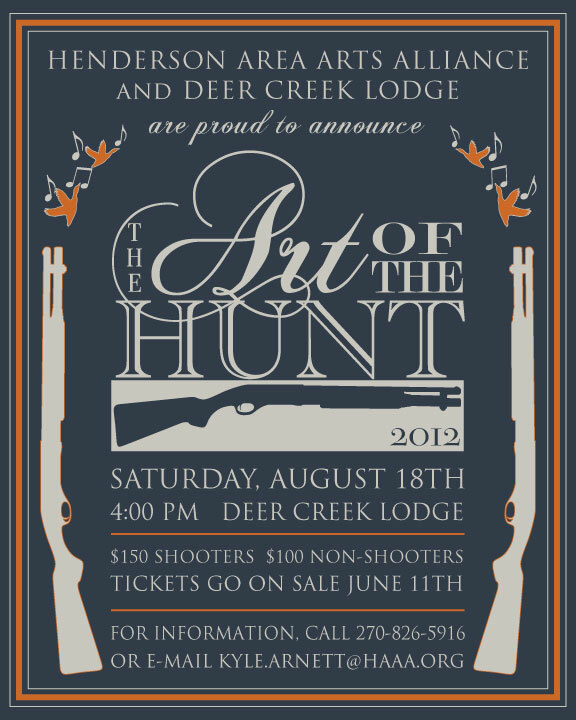 Henderson Tourist Commission – Deer Creek Lodge and Henderson Area Arts Alliance announce 2nd Annual "Art of the Hunt"
Henderson Tourist Commission / art of the hunt henderson arts alliance hunting wild game deer creek lodge henderson kentucky tickets shooting / Deer Creek Lodge and Henderson Area Arts Alliance announce 2nd Annual "Art of the Hunt"
Deer Creek Lodge and Henderson Area Arts Alliance announce 2nd Annual "Art of the Hunt"
Orvis Endorsed Deer Creek Lodge and the Henderson Area Arts Alliance are proud to announce that the Second Annual “Art of the Hunt ” will take place at Deer Creek in Sebree, KY, on August 18, 2012, at 4pm. Last year’s event included a sporting clays shoot, a wild game cooking demonstration, an Imogene + Willie pop-up shop, a silent auction, live music, dinner, dancing and more. Admission for this year’s event is $100 per person, and an additional $50 for those participating in the sporting clays contest. Tickets go on sale Monday, June 11th, and can be reserved by calling the Henderson Area Arts Alliance at 270.826.5916. Space is limited, and last year’s event sold out quickly. All proceeds from the event benefit the Henderson Area Arts Alliance. Founded in 1993, the mission of Henderson Area Arts Alliance (HAAA) is to ally the arts organizations of the Henderson area and to provide resources for member affiliates. HAAA also seeks to enrich the quality of life in the area, promote economic development and tourism, educate and incorporate students in the arts and humanities, and provide a wide array of programming at affordable prices. A key objective for HAAA is to provide a full season of performing arts at the Henderson Fine Arts Center, a $6.5 million facility that opened in June 1994 and houses performing arts events and visual arts exhibits. HAAA strives to enrich its patrons with culture, entertainment, and exposure to new art forms. For more information on HAAA or for donation information, please visit www.haaa.org.